Cluster | City - Design - Innovation » Superheroes to save our cities? Superheroes to save our cities? In his quest for a civic culture the former mayor of Bogotà, Antanas Mockus, renowned for his eccentricity and intellectual clout, made history when he presented himself before the populace of Bogotà in a spandex Superman costume proclaiming to be ‘Supercitizen’. The superman guise was one of a series of the many creative antics he used to engage with society to stimulate social change. He spread his ideas by adding art and humour to city governance and transformed Bogotà into a social experiment. The results were positive (read here). More recently an American artist, Abner Preis – whose ouvre includes bringing a pig to Art Amsterdam in response to the Swine Flu breakout and story-telling through a series of radical performances – has been taking to the streets of different cities clad in superhero gear from head to foot to transform citizens into superheroes with the power of his imagination, as part of his Superhero Project. The artist dresses up strangers in superhero outfits during unstaged, non-fictional encounters in the commons to empower people by bringing out the superhero in them. The Superhero Project was inspired by recent legislations to ban the use of Burqas based on a vague notion of an ‘ideal society,’ in which such clothing is not appropriate. 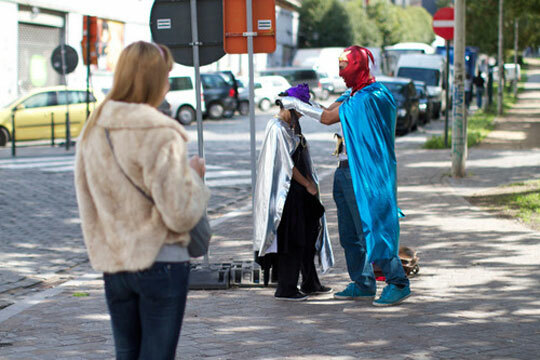 Preis seeks to alter the mindset of people as they begin to feel and dress like heroes. He maintains that wearing a mask puts people in the condition to address issues about civil liberties and democracy, and encourages people to ask how important the idea of an ideal society is when like Superheroes, it is a product of our imagination. This week in Brussels on October 22 in the context of Parcours Modo 2010, an itinerant fashion event in Brussels the HLP space will be opening with an exhibition dedicated to the Superhero Project, which will host a public performances and tours around the Parcours where visitors can dress up as superheroes. During the exhibition Preis will present a body of work reflecting on the 40 Citizen Heroes he inspired around Brussels last month and includes Portrait Photography, Video Installations, Sculptural Works and an Interactive Performance. 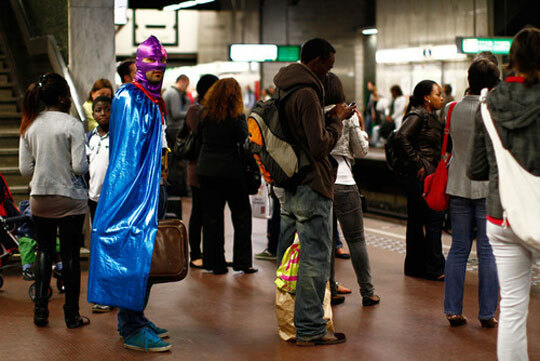 Abner Preis’ has already performed the Superhero Project at the Human Cities Festival in Istanbul and is now set to continue his social mission of sensitizing people through performance art and participation in Brussels. I = S / S = I // = S = Superheroes are in our imagination. If you have an imagination, you are a Superhero. The Superhero Project is supported by the No New Enemies, a non-profit international network of artists, designers and creative thinkers based in Brussels.